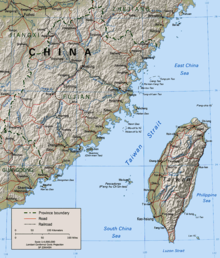 The Taiwan Strait or Formosa Strait is a 180 km-wide strait between mainland China and the island of Taiwan. The strait is part of the South China Sea and attaches to East China Sea to the northeast. The thinest part is 131 km wide. The Taiwan Strait is often incorrectly called the "Taiwan Straits". The Strait has been the theatre for several military confrontations between the People's Republic of China and the Republic of China since the last days of the Chinese Civil War in 1949 when the Kuomintang forces led by Chiang Kai-shek retreated across the Strait and relocated its government on its final stronghold of Taiwan. Wikimedia Commons has media related to Taiwan Strait. This page was last changed on 23 December 2015, at 04:08.